With more than one million people a year dying from malaria transmitted by mosquitoes, researchers at UC Davis and the University of Arizona have been trying to create a breed of mosquito that will not transmit malaria. Of course, not every breed of mosquito is a vector (transmitter) of malaria. In Maryland only one species of mosquito found in Maryland is known to transmit malaria. Since most of the malaria deaths occur in Africa, it appears that efforts would be to introduce the “malaria proof” mosquito into Africa with the hopes that it will become dominant and will breed out the mosquitoes that breed malaria. The efforts to dominate the malaria vectors would not have any impact on vectors of other diseases, such as West Nile Virus,Yellow Fever and various forms of encephalitis which have occurred in Maryland. The good news is that the UC Davis and University of Arizona researchers have received awards for the progress in their efforts. The bad news is that even if they are successful in making this “malaria proof” mosquito dominant, it will take at least 10 years to do it. To read another blog about this development click here. MSNBC and WBAL-TV recently reported that a mosquito pool in Linthicum, MD had tested positive for West Nile Virus. The health officials said they were not surprised by this finding. “We know that West Nile virus may be present throughout Maryland,” said Secretary of Agriculture Buddy Hance. “It typically appears at this time in the summer, so we are not surprised with this positive finding. People most at risk for developing severe forms of West Nile Fever are those older than 50 and those with already compromised immune systems. However, all people should take steps to avoid mosquito bites, say Maryland’s Public Health officials. 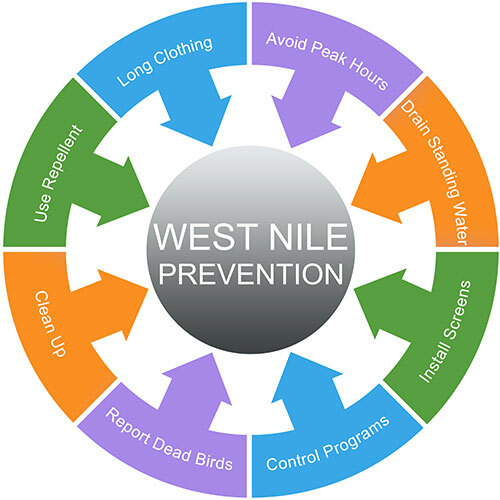 West Nile Virus is typically found in Mosquitoes from July through August. As reported in a previous post, mosquito activity often increases in hot weather. The next rain fall in Frederick and Washington counties will likely bring many more mosquitoes out. If you use professional mosquito control, ask about the satisfaction guarantee. Some companies offer mosquito control but do not guarantee your satisfaction. Nobody can eliminate 100% of the mosquitoes, but drastic reductions are possible.